Cherry pie filling is baked with a crumbly topping of chopped chocolate sandwich cookies and almonds in this crisp version of Black Forest cake. Preheat oven to 350°F. Mix cookie crumbs, almonds and butter until well blended; set aside. Spoon pie filling into lightly greased 13x9-inch baking pan; top with the crumb mixture. Bake 30 min. or until pie filling is hot and bubbly and topping is lightly browned. Cool. Top each serving with 1/3 cup of the ice cream. 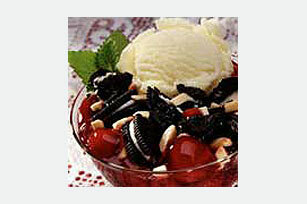 Sweets can add enjoyment to a balanced diet but choose an appropriate portion. Stir 1 tsp. almond extract into pie filling before spooning into baking pan.